Goalkeeping coach Andy Woodman has now made his switch from Newcastle to Crystal Palace permanent, leaving Tyneside after five years to be reunited with former boss and teammate Alan Pardew at Selhurst Park. Whilst most Magpies fans will say that they’re happy to see the back of Woodman, after a spell in which they feel Tim Krul has regressed hugely as a keeper, the man himself had nothing but positive things to say about the club and the city when speaking about the move yesterday. “It has been an honour to work for Newcastle United. I have thoroughly enjoyed my five years in the North-East. Myself and my family love this city and the region which had become our home. “It’s been particularly pleasing during my time here to have worked with Tim Krul and played a part in him rising through the ranks to become the Club’s first choice goalkeeper and a regular international. Admittedly, news of Woodman’s arrival is nowhere near as exciting as the supposedly impending arrival of Connor Wickham, from Sunderland, but with the new season now just a week away, we can look towards the new season safe in the knowledge that Alan Pardew finally has Woodman in place after months of trying to get him out of his contract at St James’ Park. Let’s hope we don’t end feeling the same way about him as the majority of the Toon Army seem to. The long-anticipated deal for Newcastle goalkeeping coach Andy Woodman to join Alan Pardew at Crystal Palace looks to be edging towards its completion, with plenty of news outlets in the North East suggesting that the two club’s are close to agreeing a compensation fee. A loyal member of Pardew’s staff, Woodman had previously worked under him at West Ham and Charlton Athletic, before following him to St James’ Park in 2010, where he has remained ever since. Part of the same Palace squad as Pardew in his playing career, Woodman’s own son Freddie was on the club’s books a few years ago, before relocating to Tyneside to join his dad, but now it looks as though both will be moving south once more, with the young keeper having recently agreed to a loan at Crawley Town. 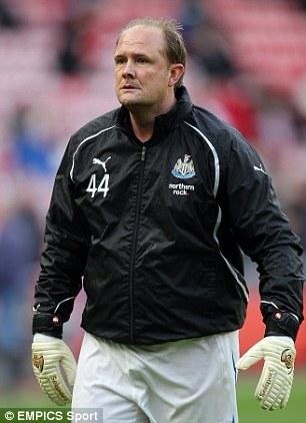 Whilst a fee has yet to be finalised between ourselves and the Magpies, it now looks to simply be matter of time until an official announcement is made, with Steve McClaren tipped to bring in Bobby Robson’s former goalkeeping coach Simon Smith as Woodman’s replacement in due time. Any conversations you have with Newcastle fans will give the impression that Woodman would be a poor appointment for the club, but in truth, they were equally scathing about Alan Pardew when he returned to Selhurst Park at the start of 2015, and up until now, that move has worked out pretty well for everyone of a red and blue persuasion. Should an official announcement be made over the weekend, we’ll have reaction to the news on the site as soon as possible.